Rodama: a blog of 18th century & Revolutionary French trivia: Citoyenne Mignot, "amie de Couthon". Citoyenne Mignot, "amie de Couthon". Georges Couthon was the object of a weirdly obsessive adulation from one of his female admirers which throws an interesting light on the relationships between Revolutionaries and the highly charged emotional atmosphere of the Year II. The backdrop was Couthon's mission to his native Puy-de-Dome in September 1793, above all his triumphant return to Clermont-Ferrand in November 1793 following the surrender of Lyons. At this moment of greatest triumph, Couthon was the object of much adoring attention, taken up in a flurry of escorts, dinners and receptions, surrounded by men vying to carry the him around and pursued, by all accounts, by a chorus of excited women. Among them none was more strange than Suzanne Mignot, who, according to the Avergnat historian Francisque Mège, had plunged into extreme revolutionary politics as a result of a failed marriage and apparently saw in Couthon a kind of god of republicanism. According to Mège Citoyenne Mignot was a believer in Mesmerism, through which she tried to cure the many infirmities of her idol. In order to be near him she become the close friend of his wife. She followed Couthon and Mme.Couthon to Lyons, haunted them in their home at Clermont and later came to in Paris - she may indeed have lived in Passy, where Couthon is known to have had a residence. According to family tradition she eventually became completely insane and died in an asylum in Paris in about 1820. We know little more about Suzanne, apart from from the bare circumstances of her birth and marriage. She was born Suzanne Revauger de Villars de Bomprez and came from a respectable family resident in Cressanges, near Cusset in Vichy. On 23 November 1784 she married Jean-François-Marie Mignot, a member of Louis XVI's elite Garde Écossaise who was later temporarily incarcerated for his royalist sympathies. 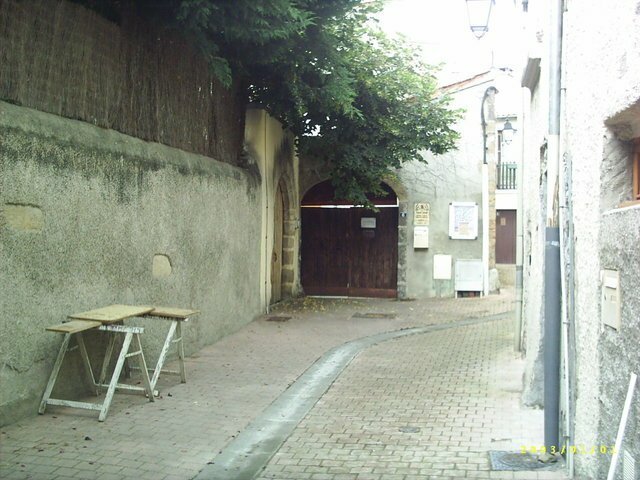 By 1790 the couple had already separated and Madame Mignon having left her husband, with their young daughter, on his estate at Thiers was living alone in Clermont. Francisque Mège reproduced the text of her successful application for divorce in September 1794 (p.643-4). We have little real clue as to her psychology beyond Mège's assessment that her solitary state allowed her leisure to fed an obsession with revolutionary politics. She was not politically vindictive but rather used her influence on the side of clemency. Despite her irregular marital situation, Mège insisted that she behaved with the utmost delicacy and purity and was acknowledged to be morally beyond reproach. The letters of fellow Auvergnat Miette Taillhand-Romme, however, suggest that the relationship was out of the ordinary and viewed by contemporaries with astonished disapproval. Others were not entirely immune to Couthon's attractions - like Robespierre, he seems to have combined the allure of power with a personable appearance and a refined manner. Miette Taillhand-Romme, commented on his "remarkable head, his gentle physionomy and his considerate ways" and reiterated that his friends followed him everywhere - particularly Suzanne Mignot. 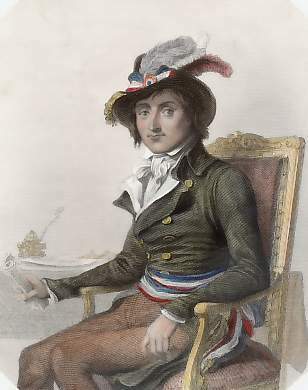 Couthon's own feelings are totally elusive .There is no sense from his surviving correspondance that he was aware of any irregularity in his relationship with Citoyenne Mignot - he remained overtly and extravagantly attached to his wife, who returned to their family home in Orcet after his death and likewise remained loyal to her husband's memory. Perhaps he was being disingenuous, or maybe, like Robespierre, he was simply anxious to trust those closest to him. We arrived . . . Couthon had a kindly face and rather distinguished manners, especially for a time at which the most coarse language and most grotesque ways were common. He occupied, near the Tuileries, a fine apartment, the furniture of which showed great elegance. He wore a white dressing-gown, and on his arm was a young rabbit which he was feeding with clover. His son, an angelically beautiful boy of three or four, alternately stroked his father's hand and the pretty white animal. These innocent surroundings and Couthon's great affability charmed me. So I related the misadventure which had befallen my poor judges, and asked what advice I could give them". "This reflection produced an indescribable effect on Couthon : his face became distorted and assumed a tiger-like expression. . . . He made a movement. The rabbit was overturned and the child, weeping, rushed into his mother's arms. . . . Couthon had seized the bell-rope, but the person who had introduced me threw herself upon him and held him in his arm-chair. I descended with lightning-like rapidity, and reached the end of the Terrasse des Feuillants at the top of my speed. As soon as I saw my guardian angel approaching in the distance, I rushed towards her and asked for an explanation of what had just happened. 'The wretched man, she replied, 'merely wanted to discover your inmost thoughts. Your cutting reproach was like a dagger-thrust in his heart. I, like yourself, thought that he was sincere ! . . . Couthon, like all the members of the Committee of Public Safety, has five or six guardsmen stationed at his house, and he was about to summon them when I held him in his chair. You would have been placed this very day in the fatal tumbril with the sixty-three victims of whom you spoke ! . . . Fortunately, I have succeeded in making him ashamed of the crime which he was about to commit against one whom I had introduced to him in confidence. I attentively followed everything you said. He is ignorant of the fact that you do not live in Paris. . . . Return home quickly, but, for fear you are recognised, do not travel by the ordinary route. And, finally, profit by this lesson. I set off there and then without seeing anybody in Paris. The judges remained immured until the death of this man Couthon, of whom I cannot think without shuddering."